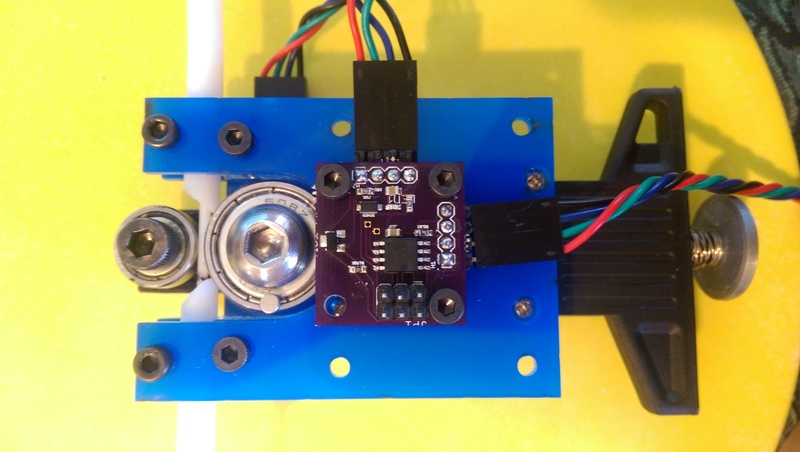 I have successfully assembled filament sensor that outputs a voltage proportional to the diameter - 1 mm - 1V. But there is a problem in Marlin. 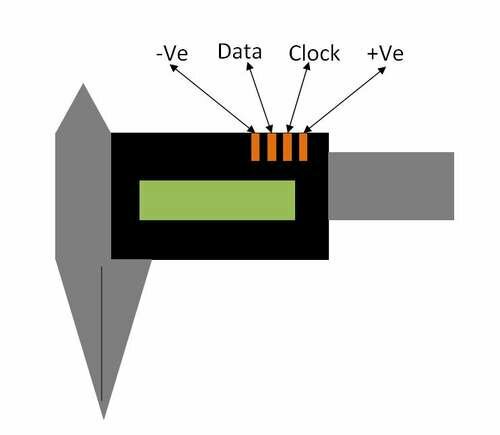 The "MEASUREMENT_DELAY_CM" works with a value of up to 5 cm. Moreover, during operation, the delay time randomly varies from 1 cm to 5 cm. And I have a "Bowden" - 69 cm !!! Marlin - 1.1.0-RC3 - 01 December 2015 (the only version, which once earned the sensor). I apologize for bad English. Can you please share the design for your filament sensor? That is sweet man. Nice job. If interested in the details of the sensor - please ask. We talked about this recently and the main question was, can it pause the print and sound an alarm so that jams or slips be dealt with and then resume the print. I am very interested in your sensor. I doubt it will work with my cheezy Melzi board but after the eventual upgrade to Smoothie this would be awesome. I'm very interested. How does it work? Where can I get one? Relay output - display button (on / off) Digital Thickness - one of the conclusions of this - "GND"
Measurement accuracy 3.3v/256=0.013mm (can be improved). It is not my design - all collected in part from the Internet. Here is a version I did, using a tire tread gauge. The pcb has the same level shifting circuit you used, and an ATTiny to read the caliper. It is just using PWM to mimic the voltage output. 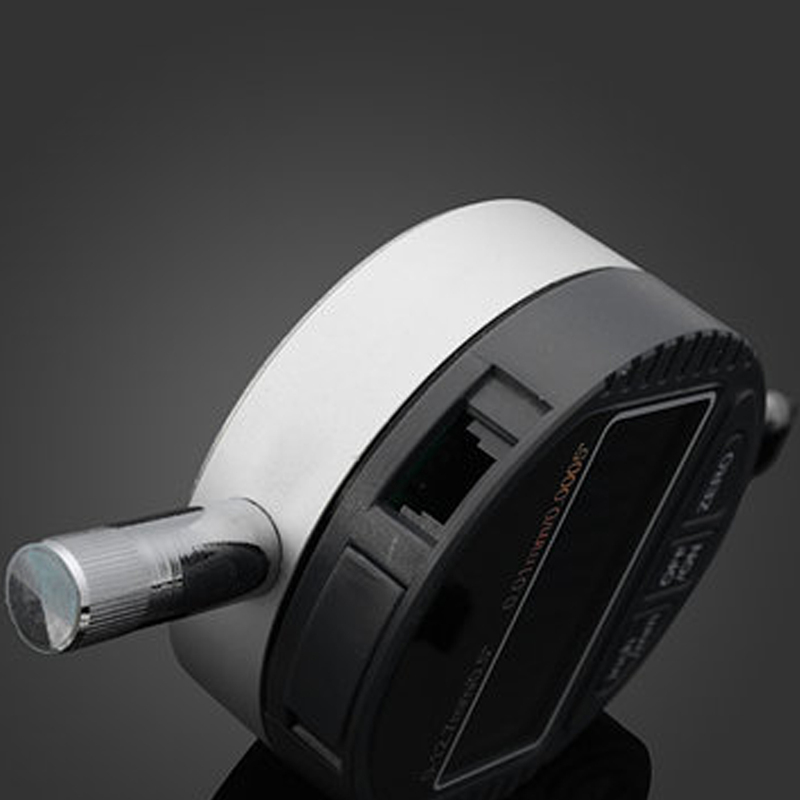 There is also a hall sensor to count the filament feed. I haven't tried running it with a printer, this was intended for logging diameter from a filament extruder. I didn't like using a voltage out for filament diameter because even though the caliper is accurate to .01mm, there was enough noise in the vref that the vout would drift around by at least .03v. It would be better if printer controllers would take filament measurement over i2c, so it can stay digital the whole time. When you have something held still in the caliper, do you find that the measurement stays steady, or does it drift a little? If the thread is in place - the output voltage is stable. I had a similar problemmy if not stabilized supply voltage. Hand touch the ground caliper - see the result. I have a tyre gauge at home that I can use to do this and give it a try. I have spent some time thinking in some fancy solutions but this approach seems to be quite good. If you are using bearings, it's vital that they are parallel, or else the measurement will change if the filament moves sideways. I opened up the gauge, pulled out the slide, and drilled a hole in the housing for the screw that holds the fixed bearing. I made the hole small enough for the screw to cut the threads. The spring should be as weak as you can get away with. 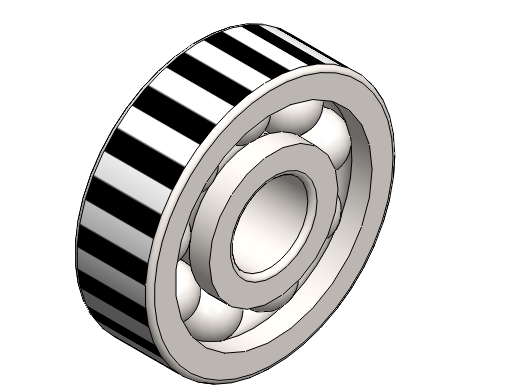 It it is too strong, the filament will spread the bearings partially by flexing the slide rather than just sliding it. 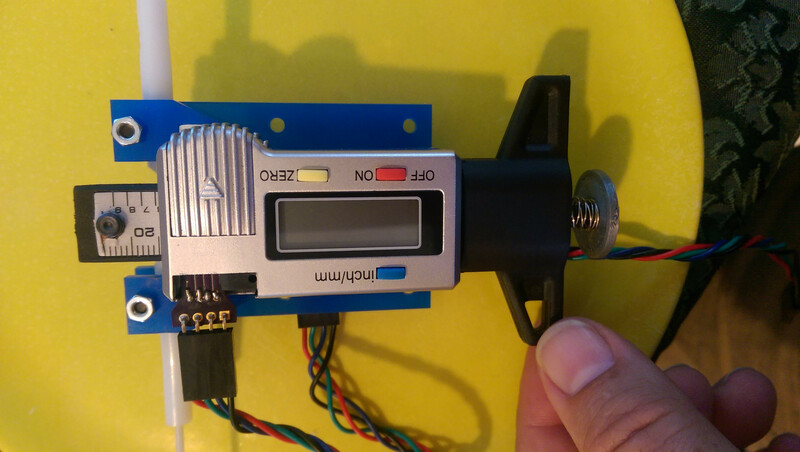 Hello I was thinking printing barcode like sticker on to idle bearing that pushes filament to extruder gear and to use an ir led sensor or simple color sensor to check if idle bearing is rotating or not to monitoring filament jamming. I'm not sure if it works or not but I think I will try when first chance I get. Edited 1 time(s). Last edit at 03/12/2016 07:18PM by toofunal. It might be easier to stick something on the side. It would be easier to line up, you wouldn't have to worry about the ends matching up perfectly. A Sharpie would work. The lines don't have to be perfect as long as it is moving. If code can be written with a built in timer. Actually I've already used a sharpie to determine if bearing is rotating or not. It is useful for manuel eye check. I will try before sticker. I've just tried the theory that I mentioned. It seems to be working. 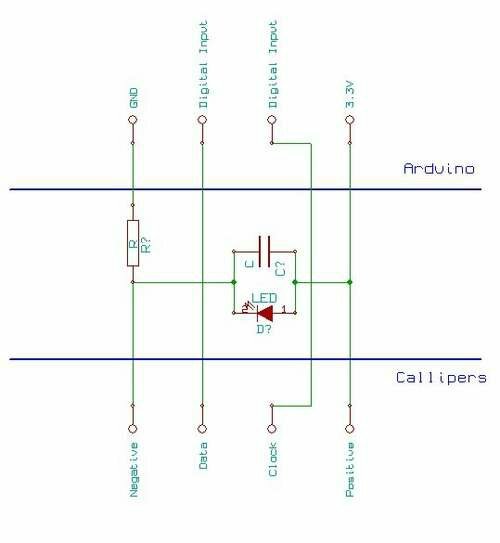 Ir led board generate logic 0 or logic 1 depending on turning idlers black or white regions. Is there anybody who can write and implant required codes to firmware? Ps: Logic may both be 0 or 1, filament may jam while IR receiver facing with white or black so algorithm should be something like that if there is no change for specific time period print should be halted/paused. This is the module for Smoothie. @olegmorgun: I don't really understand what you need the relay for. anyone have a wiring diagram ? Wonder if the data output interface of this could be used instead? Having just lost one of my DTIs to the ravages of time, I have ordered up one from the ebay site that you quoted. There is no info on the form in which data is output but will report back when I get it. Having said that, I must admit that I have some problems with using a single diametric dimension for filament as it is often quite far from circular. I made a brief attempt some time ago to come up with something that directly measures cross sectional area [forums.reprap.org]. This does work but I have taken it no further so don't know how linear, how sensitive or what external variables may make it a non starter. You must have bought the last one, i aint got one yet, i might have to pay more for one. Yeah I had no idea what would take the data from these as it's not mentioned, but figured somebody here could figure it out. Sorry, I didn't know that you hadn't already bought one. I think this may be the same thing [www.ebay.co.uk] but £0.29 cheaper and 5 left. Реле нужно для периодического включения штангенциркуля ( он каждые 5 минут автоматически отключается).